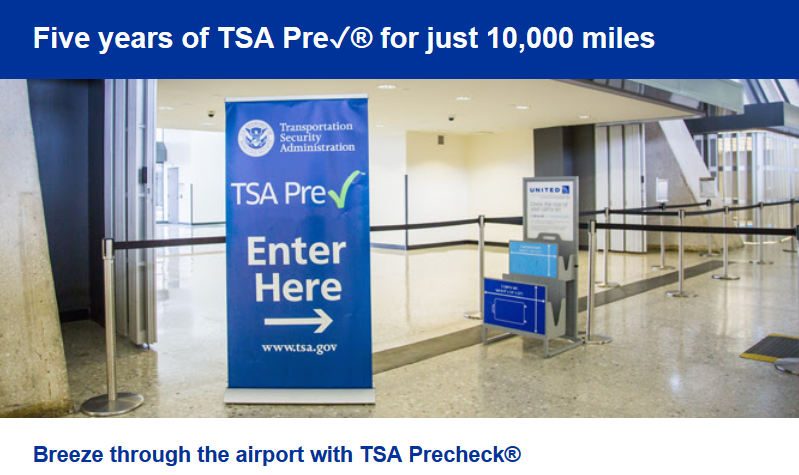 United Airlines has come up with an offer for acquiring TSA Pre clearance for 10,000 United miles. The deal is pretty simple, and includes pre-clearance at most airports, which could be useful during busy travel times. The terms state the offer is available only to Mileage Plus members, with an account address in the 50 states, District of Columbia, Puerto Rico, or Guam. You will be given a payment code which will cover the application fee. Remember, if you have Global Entry, TSA Pre Check is included, so you don’t need to apply. If you are a Mileage Plus member, and interested in using 10,000 miles to get this, check out the link below. Honestly, I think to blow 10,000 miles on this offer is a waste, as I find better uses for those miles. I was lucky enough to be a card holder for the TraveElite card, which gives me FREE Global Entry. I’m not going to put a price on the miles as they are as valuable as YOU see them. Some people find United miles worthless, as they are expensive to redeem on partner airlines, and some people find them as valuable as gold, as they may be used for a sweet spot redemption, such as Swiss, or Lufthansa, if the availability is there. Let me know if you think this is a good value. Happy Travels.